On a cool, breezy day, under the beautiful blue Hale’iwa sky, the 4th grade class of my son’s elementary school presented an ‘oli (chant) to humbly request Aunty Nona, Kumu Mokihana, Aunty Lisa, as well as, spiritual ancestors to share knowledge with them. Winona Pihana-Chaney, 83, also known as, Aunty Nona – is the daughter of the late Mary K. Kelii Pihana who was the Hawaiian Studies kupuna at Wahiawa Elementary School. 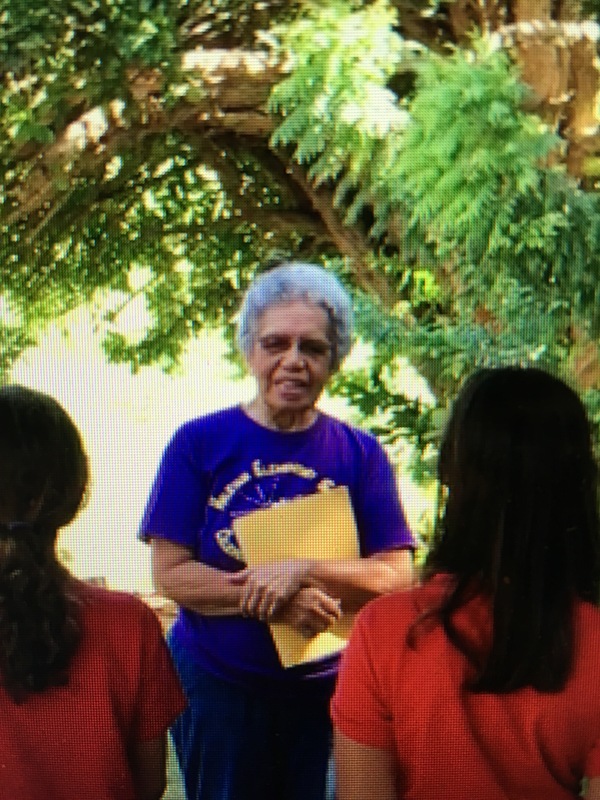 Since 1993, Aunty Nona has continued the work of her mother by bringing children to her taro farm where they learn, through hands-on activities, about kuleana – responsibility, and to mãlama ‘āina – protect the land, all while getting dirty, eating ono taro and crafting with lauhala. The children are immediately put into three rotating groups. Our group’s first activity was to make a lauhala bracelet. As the chaperone, I helped pass out bracelets that were already started and ready to be woven while Aunty Nona instructed them on a simple checkerboard weave pattern. I too was given a bracelet to weave and Aunty Nona began to talk story, “You know, I was an accountant and I hated arts and crafts.” Having worked in accounting for 10 years myself, we immediately hit it off. She continued to tell me how she started educating student at her farm, “One day a principal came to me and said, ‘I want to bring my students to your farm,’ and I said, ‘Reeeaaaally? !’ I was surprised.” Soon, it became a place of learning and fun for many children that would come from all over the island. Aunty Nona praises Governor George Ariyoshi for prioritizing Hawaiian Studies education. She returned her attention to the children, “Oh, you have to redo yours, make the weave tighter,” and “Oh, you get an A+,” she said as she walked around guiding them on getting a perfect tight weave on their lauhala bracelets. After their bracelets were completed and labeled with their names on strips of masking tape, we moved our group to Aunty Lisa’s outdoor kitchen. Aunty Lisa is the daughter-in-law of Aunty Nona. She taught us about taro and demonstrated the mashing of taro to make pa’i ‘ai. Aunty Lisa’s poi pounder is about 80 years old – made by her husband’s grandfather. Pounders required a lot of labor back then. They were formed by pounding two other stones to shape it, and smoothing the surface with sand. We all became hungry while she told us all the different dishes made from taro that she makes like mashed taro with butter and garlic, and fresh mango pa’i ‘ai bread! Mmmmm! It was almost lunch time too! Keeping the taro in the middle of the board was a little challenging for my son! After mashing and bagging their taro to take with them, students got to taste some of what they made. They were responsible for cleaning up and setting up for the next group to participate. Next, we moved down to the taro patch and Kumu Mokihana – Aunty Nona’s son and Aunty Lisa’s husband – taught us how to play ‘ulu maika (a hawaiian game where you role a disc between to sticks several feet away). Lastly, it was time to jump get dirty and jump into the lo’i. Kumu Mokihana taught us how taro is sturdy enough to survive floods and droughts. In 2008 there was a big flood, many farms in Waialua lost their crops but the kalo (taro plant) survived. Having the children play in the lo’i is helpful in tilling the soil between harvests. It is good to move the nutrients around before planting the next crop. I had my sneakers on in the lo’i, moving slowly, pulling my shoes out of the mud with each step. Everything was squishy, squishy, squishy. The color of the mud is rich like dark chocolate and feels smooth in the hands like soft serve ice cream. As I watched my child swim and play in the mud, I thought a little about my anticipated laundry situation. As we rode back on the bus, I thought of the precious ‘āina as our beautiful playground that provides us with everything we need to sustain life – air, food, and water. It’s important to give back and take care of our land because it takes care of us. Aunty Nona and her ohana opens their hearts and their homes to provide a truly fun and meaningful experience for all. Recently, on a day off, my kids asked to go on a hike. Having lived here all my life, for some reason, I have never visited the Lyon Arboretum in Manoa. It was the first time visiting for all of us. It’s a wonderful hike if you have elementary and middle school children. There is an app with an audio tour and information about the various gardens and trails. There are also signs that give valuable information on the various plants. They even mark the ones that are endangered. The kids love to follow the map, identifying the markers along the main trail up to the ‘Aihualama Falls. Here’s some information about the arboretum to help prepare you for this fun educational field trip. The arboretum is hiding behind Treetops Restaurant at Paradise Park. Just drive past the Mānoa Falls parking lot and trailhead. At first it doesn’t look like there is anything beyond the Mānoa Falls parking lot as the road starts to narrow, but keep going and soon you will see the parking lot for the Lyon Arboretum visitors. You can get driving directions and transit options on their website. First, check out their website – it has a huge wealth of information. Everything from the history, visiting hours, tour times, calendar of events, information about research, how to volunteer, safety guides, and more. They offer events such as Mindful Hike and Yoga, Botanical Jewelry Workshop, and Plant Sales. Download the Lyon Arboretum app. The app has an audio tour that you and your kids can play while exploring the gardens. The audio tour is a great way to learn about Hawaiian history and the indigenous plants, as well as, their usefulness and importance to the environment. Once you get there, you will see the visitors center. A volunteer is there to greet you. There is a place to sign in and a donation box ($5 recommended). Free maps are available and you can buy snacks, water, souvenirs, seeds, plants, and handcrafted items. If it’s rainy, there are umbrellas for visitors to borrow. Daily guided one-hour tours are offered Monday through Saturday from 10 a.m. for $10 per person. Space is limited, so it is recommended that you call 24 hours in advance to reserve a space. Walk-ins are accommodated if there are spaces available. My boys and I wandered around some of the various gardens before heading onto the main trial toward the ‘Aihualama Falls. The trail is safe for most children. We saw children as young as about 5 years old on the trail. It took us about 45 minutes to leisurely get to the falls. Mānoa is typically damp and prone to mosquitoes, so applying some sort of repellant and sunscreen is recommended. A little less than half way up the main trail is the Hawaiian Section – a large area consisting entirely of native Hawaiian plants. This also, served as a nice spot to rest and drink some water before continuing on to the falls. Be sure to bring your camera, if you’re like me, you’ll want to take photos of the many plants every 2 to 3 feet! When we got up to the falls, it was pretty dry. You’ll be able to view a photo-perfect waterfall if you go right after a recent rainfall. When I asked my kids (Gavin, 11 and Cameron, 9) for feedback, here’s how it went. Me: Gavin, how did you like the arboretum? Me: Cameron, would you go again? So, there you have it, simply stated. Recently, with the world watching the fate of Mauna Kea unfold, I also began to question the importance of its protection. Several determining life experiences have affected my thoughts of whether or not the construction of 18 story high observatory should be supported. First of all, I have been married to my husband, Alex, for almost 14 years. He is very analytical, while I am very emotionally driven when it comes to making choices. This is why we make a great pair when making family decisions, but, I digress. Secondly, I lived in Okinawa for a year, this is the land of my ancestors, and while I was there I strengthened a bond with them that, as I sit here blogging, trascends over space and time, and there is a phrase for that connection taught to me, by my Sensei Frances Nakachi, to be “tukeya hizamitin” or “transcending hearts.” Finally, my children are always watching me. Through every. thing. we are connecting them to what has been passed on for hundreds and thousands of years. Through what we feed their bodies, minds and hearts as parents, we are showing them what we value as our parents and grandparents taught us through their words and actions consciously or unconsciously. So now that I have established a little background about a few of my life experiences, I will share with you how I wavered greatly with my feelings about the observatory construction. Being the very balanced married couple that we are, some of Alex’s analytical sense had rubbed off on me and he has learned to consider one’s feelings before sharing his very truthful observations (there is a very funny story about us going on a sushi date and he mentioned that I should be able to at least eat the same amount as him since my stomach was obviously bigger than his). Back to Mauna Kea, many of the questions I initially asked myself involved why science and spirituality can’t get along. Must they be separate? I even went as far as thinking, can this observatory be an enhancement to Mauna Kea procuring a connection to the Universe? On and on my brain went on to justify that the observatory would be good for all people of the world. This may just as well be the same reasons for many who support the construction of the observatory. Later when I read Ed Morita’s article in Frolic Hawaii, I became more convinced that my position was a well supported one. However, for me, I guess, even though I thought of so many good reasons to move forward it did not sit right somehow in my heart. As I write this blog, my discussions with Alex still vary back and forth, and, there are many good arguments that can be made to support the construction. Even with all that, my relationship to my own Motherland, is the single reason I support the protection of Mauna Kea. 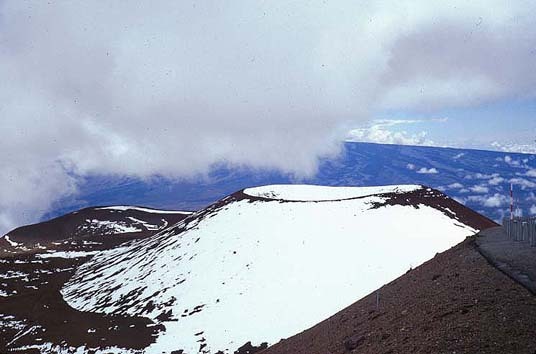 When this connection was brought to light, I knew with all my heart that Mauna Kea should be protected. I began to think of a place in Okinawa called Sefa Utaki. It is the most sacred place in Okinawa and people come from around the world to feel its divine, rejuvenating power. Created by the goddess Amamikiyo, Sefa Utaki overlooks the Kudaka Islands. The lush forest, unique rock formations, and caves are her precious treasures. Holy waters drip from stalagmite formations. How saddened I would be if ANY construction would take place at such a beloved sanctuary that has been sacred since the beginning of Okinawa’s history. At this thought, I knew in my heart that Mauna Kea should be protected. No analysis needed, only tukeya hizamitin – my connection to Okinawa and my ancestors. This is a knowing that indigenous people have even when they return to the Motherland that they weren’t even born in, but where their ancestors originated. This is the connection I feel the Hawaiians want to protect, and it’s hard to justify it to those who have not experienced this feeling of connection, but, have so many analytical reasons why we should construct. Is the love for your child less real than the smart phone in your hand because you cannot see it? My friends have shared a powerful video that explains the perspective of those who love Hawaii and are protecting Mauna Kea. My children are growing up in Honolulu, and right now it’s more important than ever to take them out to play in sun and in the ocean. Technology is so accessible and constant that it takes more effort to unplug them, throw them in the car, and connect them with the land. They need to be in nature so that they know that everything we need to live comes from nature. Sure people can create phones, computers and cars no problem. Food, air and water come from nature. My grandparents were not necessarily strong spiritual people, but they lived off the Hawaiian land, said itadakimasu (expressed gratitude) before each meal, and worked in the yard. It was easy back then to be akin to the land and constantly reminded that it was the land that took care of you. I believe that protecting Mauna Kea is not a protest against technology but protecting the ties of Aloha that transcend through time and space.